Deep in the Archive of Ultimyr, shelved between scholarly treatises on dragon cladistics and books of untranslatable spells, there is an ancient tome of entomological curiosities. Compiled by scholars, the book describes the telepathic talents of the zealot scarab, a strange species of social insect with abilities unique to all the seven planes. Unlike most grubs of his colony, Nyx Assassin did not arise from metamorphosis with the plodding thoughts and blunted appendages common to the worker caste of his kind. For his was a special transformation, guided by the grace of Nyx. He was the chosen one, selected from the many and anointed with an extract of the queen goddess herself. Not all survive the dark blessing of the queen's chamber, but he emerged with a penetrating mind, and dagger-like claws--his razor sharp mandibles raking the air while his thoughts projected directly into the minds of those around him. 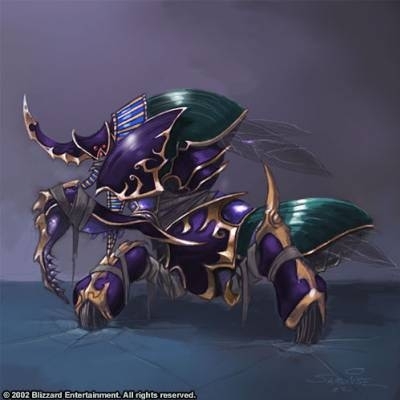 Of all zealot scarabs, he alone was selected for the highest calling. After his metamorphosis, he was reborn, by grace of Nyx, with abilities which shaped him for one thing and one thing only: to kill in the name of his goddess. Nyx Assassin is the real ganker. All his skills are designed for ganking. He have invisibility. He have stun, and usually, he is equipped with Dagon for instant kill. He is capable of fast killing with just about 5 seconds. He is one of the best solo kill hero for early-mid game. He also have mana burn that can reduce enemy's mana and make enemy can't spam their skills. If you are a big fans of fast killing, then choose him! Rock spikes burst from the earth along a straight path. Enemy units are hurled into the air, then are stunned and take damage when they fall. All zealot scarabs possess intimate knowledge of underground pathways, using them to their advantage. This is your main skill for anything. Like: farming, ganking, and teamfights. You can farm using this because it can deals damage to several creeps. And you can use this in ganking because it will stun / disable your target. And in the teamfight, you can use this to disable the enemies. Stun is important for teamfight. With the enemy stunned, your team can hit them comfortably. Destroys the target hero's mana equal to a multiplier of its Intelligence, and deals damage equal to the mana burned. 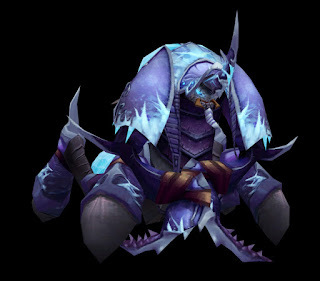 The tome in Ultimyr describes one scarab with the ability eat away at the mind of lesser beings. Burn enemy's mana based on his Intelligence stats. With the increasing of this skill, it's just decrease the cooldown and not the multiplier, but remember that on late game, the INT stats of your enemy is high and of course the damage will be high too. When activated, Spiked Carapace reflects and negates damage dealt to Nyx Assassin (max once from each source), as well as stunning the source of the damage. While their carapace is relatively thin, it's guarded by a retractable field of razor-sharp spikes. This skill is your defense skill, with this skill, you can relfect enemy's damage and stun your attacker. You need to activate this and if the enemy attacks you, he will receive his own damage and being stunned. A good skill to defend yourself to not being damaged or killed by enemies in ganks or in teamfights. Allows Nyx Assassin to become invisible and gain a speed bonus. If Nyx Assassin attacks to break the invisibility, massive bonus damage is dealt with the attack. 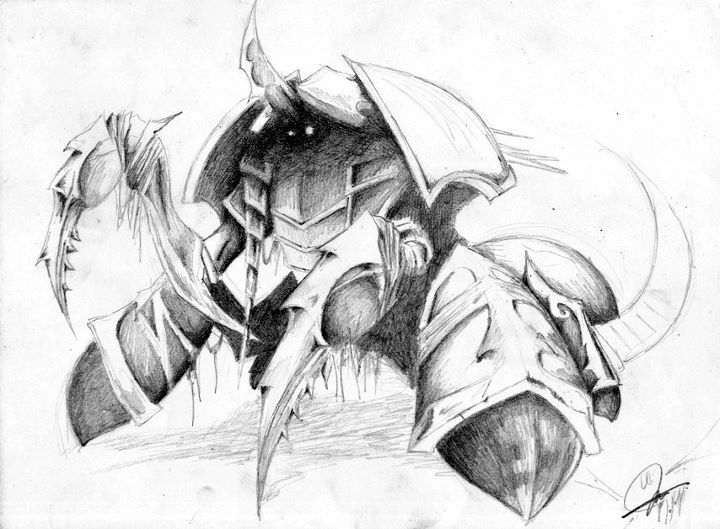 The scarab kills for the glory of his queen. This skill is your main ganking skill. You become invisible and ready to find the weak opponent. This skill gives you bonus attack for your first blow from your invisibility. Very nice to start a solo kill, remember that you are one of the best solo killer in DotA. First is to use this skill, and then followed by your stun and mana burn and then use Dagon and right click until your target dies. Why take Impale for level 1? You need Impale to escape if enemy wants to get firstblood by killing you. You need to stun them and run. Or you can use this to get firstblood too, stun them and attack together with your friend. Why maxed Impale first? This is your main nuke, you will need this for ganking, farming, and killing or early mid game. Why maxed Mana Burn before Spiked Carapace? You need your Mana Burn to be spammable. If this skill is already on level 4, you can do 2-3 times Mana Burn per teamfight. And spiked carapace level 1 is enough for early-mid game, and can be maxed late for your defense in the teamfight. On early game, if you are a support for your carry, try not to steal the last hit from him. Deny is good, denying will reduce the gold and exp from the enemy. Use your Mana Burn once in a while, this will reduce enemy's mana and make them can't spam their skill. Impale is useful for stun your enemies. This can be use to find the firstblood or just to harass them. Impale also can be used to farm some creeps. 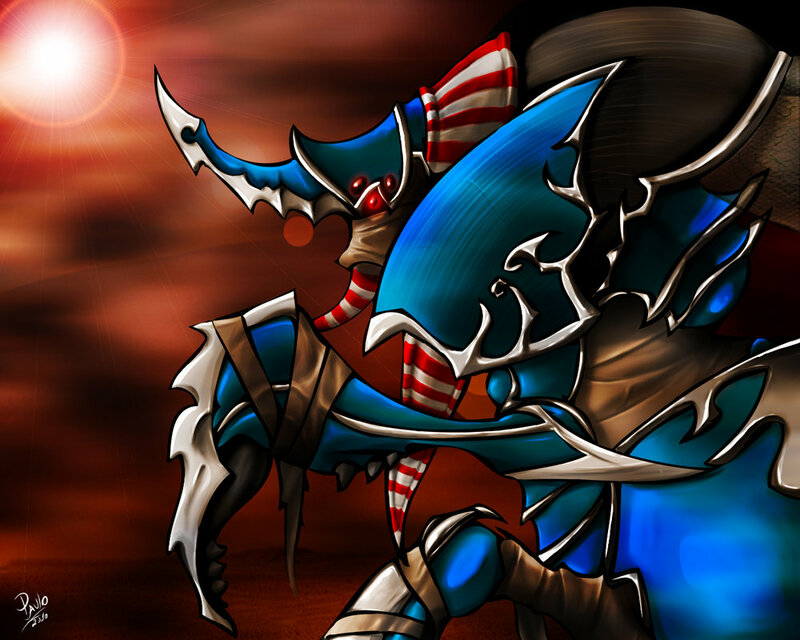 Use Spiked Carapace to defend against enemy's attack. If they are chasing you, immediately activate the Spiked Carapace and make them stunned. This is your time to shine. I believe you already have the Vandetta here. With this skill, you will gank everybody and will find some kills on the mid game. This kind of kills is important because if your team is leading since mid game, it will be likely to be owning on the late game. Choose 1 target to start with. Ask your friend to help you in this gank. And then use the Vandetta - walk to your target - and stab your target. And after that you can use Impale, and mana Burn. Better if you have Dagon because it will guarantee the kill for you. Mid game also is the time for the first few teamfights. Always try to use the Impale on al least 2 enemies. This will disable 40% power of the enemy. Use Mana Burn to INT hero and hope he will loss many of his mana. Remember to always right click one enemy and make sure you are useful in the teamfight. On late game, your power is not as powerful as mid game. But still you should doing something for your team. Impale is your main skill here. You should try to get at least 2 enemies in your impale. With the right Impale, your team can get the advantage in the crowds of teamfight, like: they are all disabled and your team can easily harass and kill them. Remmeber that now your Mana Burn has reaching it's maximum potential and now deal tons of damage to enemies. And the low cooldown is important for you to deal lots of damages in the teamfight. Cast this skill to the INT hero of the enemy. They (INT hero) have high INT and will feel the more pain of this skill. Also use Spiked Carapace to defend and this skill will also stun one of the enemy. After winning a teamfight your team have 2 options, to push or to Rosh. Thaose 2 options is both good choice. Just need to choose it base on your leader or based on vote. Active: Switch Attribute - Changes selected attribute between Strength, Agility and Intelligence. Flat movement speed bonuses from multiple pairs of boots do not stack. Active: Replenish Mana Restores mana in an area around the hero. Why Power Threads? It will gives you attack speed, thats what you need, attack speed and damages. Power threads is laso a flexible shoes, you can change it to STR, AGI, or INT for what you need. STR for Survivability, AGI for damage and attack speed, and INT for mana. Why Arcane Boots? It will meake your skill Impale spammable in every situation in early-mid game (stunning foes, farming, harassing). Arcane Boots also restores mana for allied heroes. With this, your instant kill potential will be maximized. Use backstab from your ultimate, Impale, Mana Burn and then after that you can use the Dagon for finishing. Active: Damage Return - Returns any damage you take to the unit that dealt the damage. Lasts 4.5 seconds. Why Blade Mail? You already have the Spiked Carapace, and with this item, your counter attack ability will reach the maximum potential. After you initiate a teamfight, your opponent is likely to target you because they will hate you. So you can reflect their damege using this item. Why Ethereal Blade? It will boost your magical damage, first it will deal damage from Ethereal Blade itself, then it will amplify the magical damage from Impale, Mana Burn, and Dagon. After stabbing your opponent, you need the physical damage to make sure you get the kill, with DPS items it will become true. Passive: Corruption - Your attacks reduce target's armor. Desolator is a Unique Attack Modifier, and does not stack with other Unique Attack Modifiers. Why Desolator? Increase every damage for your target because this item reduces enemy's armor. Your damage like BackStab Damage, Impale Damage or Mana Burn damage will be amplified. Bkb is useful to defend yourself against enemy's magical attacks. And Battlefury is useful for dealing splashing damage to all enemies in the teamfight. Choose your own DPS items.As a carry, damage is your priority. DAEDLUS: Daedlus will provide you with a powerful Critical Strike. RAPIER: Be careful if you choose to hold this. 1 hit kill is a sure. 2-3 hits is the worst. Need protection from your support. Must come if the situation is clear safe for you to come inside the teamfight. Need some disabler friends. Heart of Tarrasque is so good for survivability on the late game and Boots of Travel on la,te game is a must item because you will need to always change lane quickly for defend or attack. They have skill that reduce enemy's armor, very synergy with your solo-kill style because you will be able to solo kill your target easily because your damage will be amplified. Slardar and Gondar have a true sight ability that makes your team to be visible, beware of these two heroes. Those items can reveal your team, so be careful with the holder of those items. They have DPS + Silence that makes you have a hard time. for the late game, very recommended for you to target the high INT hero because it will deal more damage.